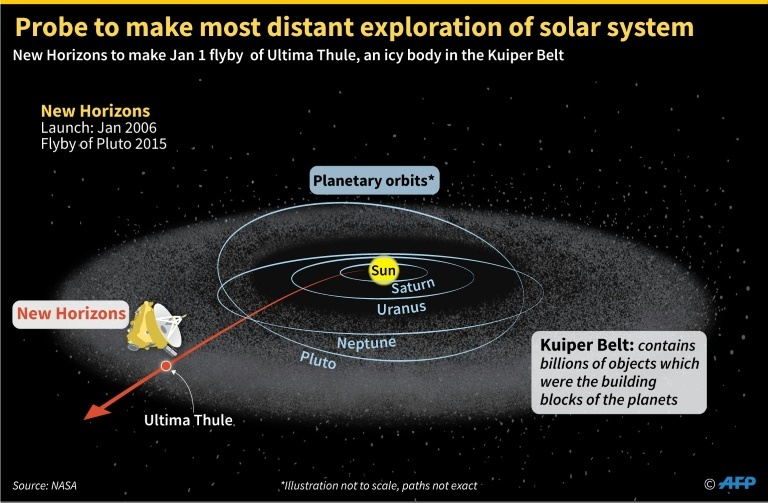 NASA counted down Monday to a historic flyby of the farthest, and quite possibly the oldest, cosmic body ever explored by humankind — a tiny, distant world called Ultima Thule — in the hopes of learning more about how planets took shape. The US space agency planned to ring in the New Year with a live online broadcast to mark the spacecraft’s zoom past the mysterious object located about four billion miles (6.4 billion kilometers) away in a dark and frigid region of space known as the Kuiper Belt. The flyby at 12:33 am Tuesday (0533 GMT) will take place about a billion miles beyond Pluto, which was until now the most faraway world ever visited up close by a spacecraft. A solo track recorded by legendary Queen guitarist Brian May — who also holds an advanced degree in astrophysics — was set to be released just after midnight to accompany a video simulation as NASA commentators describe the close pass. Alan Stern, the lead planetary scientist on the New Horizons mission, told reporters that Ultima Thule is unique because it is a relic from the early days of the solar system and could provide answers about the origins of other planets. But the encounter itself is risky, and if the spacecraft were to collide with a speck of space debris as small as a grain of rice, it could be destroyed instantly, mission managers warned. The first signal back to Earth should come about 10 hours after the flyby, around 9:45 am (1445 GMT). Only then will NASA know if New Horizons survived the close pass. Every 20 minutes, the spacecraft’s cameras and infrared imagers are capturing shots of the space rock, “so as it rotates and we get closer we will get good data on all parts of it as we approach,” said John Spencer, a scientist with the Southwest Research Institute. The flyby will be fast, at a speed of nine miles per second. “New Horizons will continue in that legacy,” Stern wrote.